Do You Have What it Takes to Reach Your First 100 Million? Many people who are curious about the advanced growth strategy used by self-made tycoons can’t decide if it’s for them or not. This is due to the strategy being dense and arcane. To solve that problem we offer a mini-version of The Tycoon Playbook course to help people determine if it’s something they are both capable of doing and willing to do. It’s not for everyone. This is an elite strategy. First and foremost, people who go down this road have that “gotta wanna” drive which makes them self-starters. They don’t need anyone holding their hand or cracking their backsides with a whip. They just do it. That is once they understand how it’s done. So here’s your opportunity to discover in a single hour if this strategy is for you. 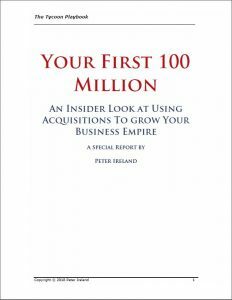 This report will help you to make the right choice in a career decision that could very well take you to your first 100 million and beyond. Length 53 pages. People with the report will benefit from the occasional special offer or perk which will be worth anywhere from 10X to 20X its price.